Fun fact #1: Cicadas have emerged and swarmed Staten Island, NY. Exterminators have perhaps their biggest project ever. Will the cicada infestation of 2013 be worse for Staten Island residents than the 2011 wild turkey infestation? Fun fact #2: Brood II periodical cicadas have red eyes and clear wings. You can tell the difference between a dog-day cicada and a periodical cicada by looking at the eyes and wings. Fun fact #3: Cicadas do minimal damage to plants. Insect experts say that the minimal damage that cicadas do is the result of laying eggs in branches. Also: Cicadas do not bite humans or animals. 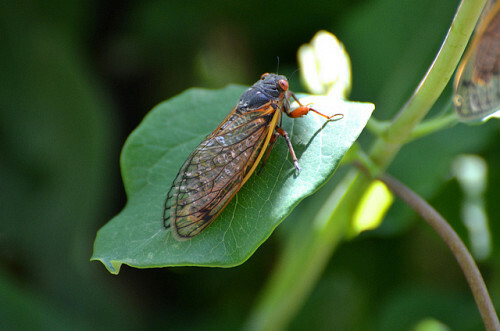 Fun fact #4: The most annoying thing the Brood II periodical cicadas will probably do is make noise. Boy howdy, do they ever make noise. The mating sounds of cicadas can reach 100 decibels. That's about the same decibel level as a jackhammer in action. Fun fact #5: Female Brood II periodical cicadas lay a lot of eggs. How many eggs do they lay each? Around 600 eggs per female. Fun fact #6: Cicadas are not locusts. According to the Audobon Society, although periodical cicadas are referred to as "17-year locusts" in the vernacular, they are not locusts at all. Locusts are a type of grasshopper that swarm like a plague. Periodical cicadas are...cicadas. They are not locusts at all. Fun fact #7: Periodical cicadas don't stick around long. According to a report by the Wall Street Journal, periodical cicadas emerge from their underground nests, make a lot of noise mating, and as soon as the female lays eggs, she dies. The male cicadas die shortly thereafter. And then you won't see them again for 17 years. Fun fact #8: Some people say that you can eat cicadas. With apologies to Fran Lebowitz: If you're going to Staten Island, bring your own food.